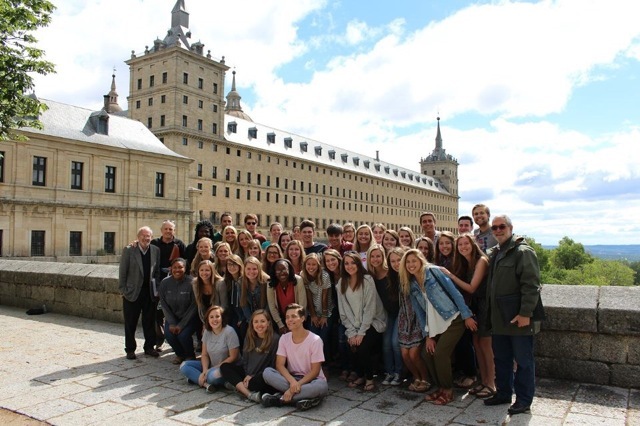 The University of Alabama has a study abroad summer program in Spain (Madrid). See the Education Abroad pages on UA in Spain: Summer Session I and UA in Spain: Summer Sessions I & II for more details about the program. This program will provide students with a total immersion in the Spanish language and culture and a unique opportunity to visit historical sites and monuments as well as world renown museums, like the Prado Museums and the Reina Sofia Museum of Modern Art. The program is designed to complement the instruction received at the University of Alabama for Spanish minors and majors. Antonio de Nebrija University is a private institution founded on the principles of free initiative, with full official recognition pursuant to the Law of the Cortes Generales (Spanish Parliament) 23/95 of 17 July (BOE –Official State Gazette-of 18 July 1995). Nebrija is a independent Spanish university created with a firmly international outlook and a practical focus. Our mission is to maintain the highest standards of academic teaching and scientific research in all our specialized areas in order to contribute not only to the training and professional and human development of our students, but also to progress of society in general. It has been said of Nebrija that it is “the smallest of the great Spanish universities” due to the success of its design and size which is able to guarantee students a personalized education and excellent possibilities for both academic and professional development. The international profile of Antonio de Nebrija University is another outstanding feature of the institution, as it is the first Spanish university to have a considerable percentage of foreign students and because many students also undertake a good portion of their studies abroad. The University offers a wide range of international programs, some of which are awarded dual qualifications and others which provide Spanish students with the opportunity to spend one or two semesters or academic courses in prestigious universities in Europe the USA and Canada. A concern for practical training, professional development, and adaptation to new technologies is manifested in the incorporation in all the university syllabuses and study programs of practical professional classes as a complement to the studies of all our graduates providing the knowledge, skills, and attitudes acquired in the professional workplace. You will find an extensive range of specialized areas at Nebrija, all officially approved courses leading to diploma qualifications, technical engineering, degree and engineering courses as well as master degrees and doctorates. It also provides its own wide range of qualifications and further and higher education programs. Applied research and interactive teaching methods are further outstanding features of the institution, contributing useful knowledge to society and the business world, and for training of teachers and researchers. The entire organization is at the disposal of students and teachers offering the best professional opportunities with all the advantages of a good university. The university offers state of the art classrooms, spacious individual bedrooms with individual bathrooms, private dining hall, cafeteria, computer lab, wireless Internet, TV room, movie theater, gym, swimming pool, covered gymnasium with sports facilities, laundry, library, private gardens, leisure areas, etc. The regular faculty staff of the summer school hold the highest academic level. All the teachers posses a PhD degree and have many years of experience teaching Spanish language and culture to both foreign and native students. You can see a promotional video of the institution here. Students live at the school’s Residence Hall in individual or double rooms. The accommodations are located next to the university, so it is very easy for the students to access the classrooms. The residence has a 24-hour Reception, but the program has a curfew of 12:00 am during weekdays and 1:00 am on Fridays and Saturdays. In order to be out of the school beyond those hours, students must complete, sign and turn in a mandatory notification form in advance that it has to be approved by the director of the program. Failing to fulfill this requirement can result in suspension or even expulsion from the center. Students have access to 3 daily meals in the school’s private Dining Hall. The menu is changed every day, and there are options for special diets, vegetarian, lactose intolerant, etc. The Dining Hall is open daily from 8 am to 10 am for breakfast, from 1 pm to 4 pm for lunch, and from 8 pm to 11 pm for dinner. For weekend trips, students are provided with a picnic bag lunch. An exclusive U of A office is available for the students during the whole program. Students can stop by anytime during the day from to 9pm to 2 pm and from 4 pm to 8 pm. The office offers 2 computers and a printer that can be freely used by students during the program. Director and Assistant director can be reached after these hours in person or by phone 24 hours a day. Besides the trips and excursions during the weekends, the program offers many other activities outside the classroom. Taking advantage of the proximity of Madrid, the capital of Spain, the program offers weekly visits to the museums and cultural areas of the city, including theaters and movies. Students also have the opportunity to visit shopping and leisure areas, social and sport events, etc. Spanish gastronomy (tapas, restaurants, etc.) is also part of these activities. Every weekend student travel to different locations around Spain. These trips are designed to complement the weekly class lectures. Students who choose to travel by themselves must complete, sign and turn in in advance a mandatory notification form giving all the information of their trip to cover emergency situations that could arise. -Students need to complete SP201 and SP202 before attending the program. -A minimum 3.0 GPA is required to be considered for the program. Preference will be given to students with a GPA higher than 3.3. For any additional details, please contact José Cano at jcano@ua.edu.